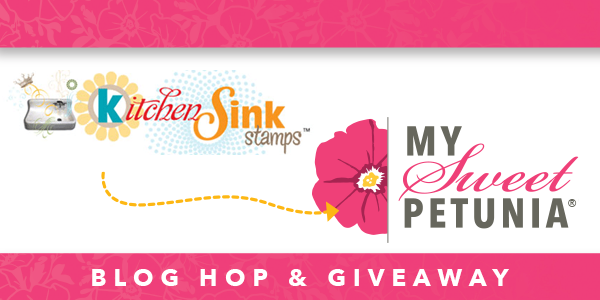 Welcome to the hop between My Sweet Petunia and Kitchen Sink Stamps. 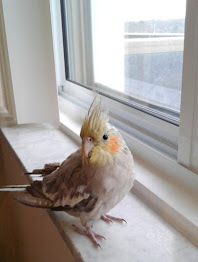 We are happy to have you join us for today's hop. 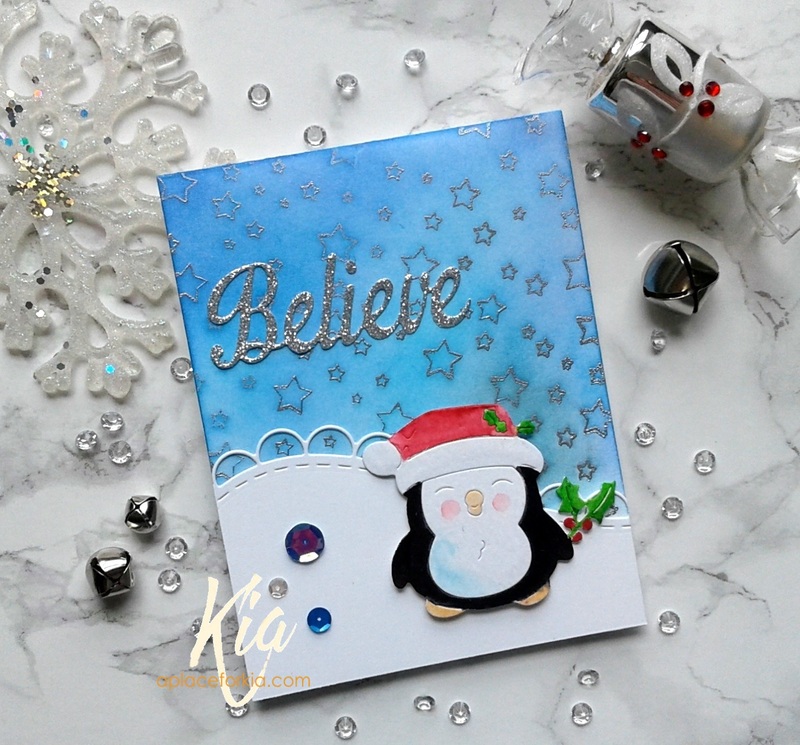 We have lovely cards to share and prizes too. 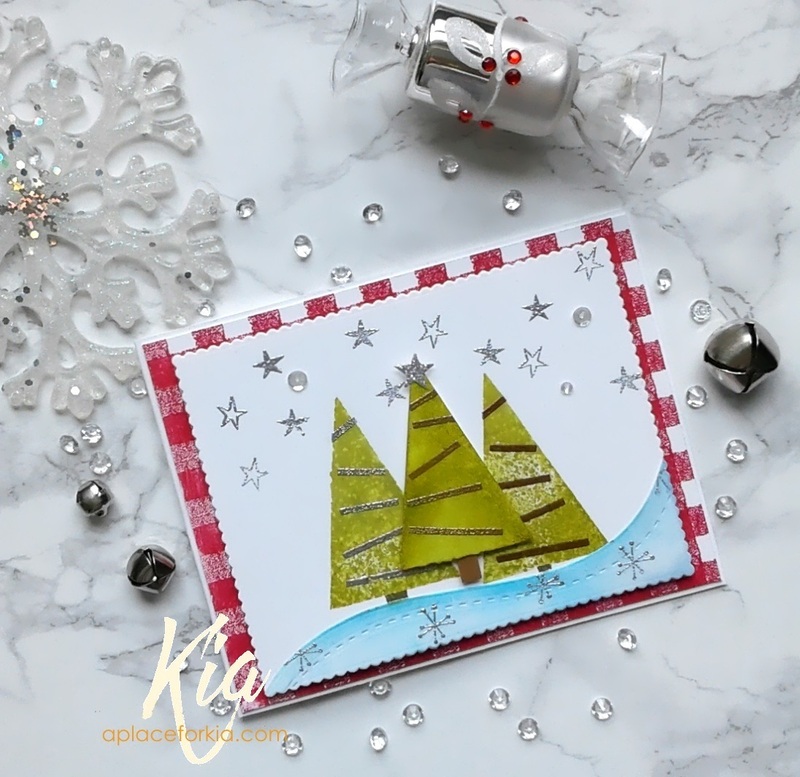 Everyone who comments on every stop of the hop will be entered to win one of two prizes - the winner's choice of an Original or Mini MISTI, and a $50.00 Gift Certificate from Kitchen Sink Stamps. 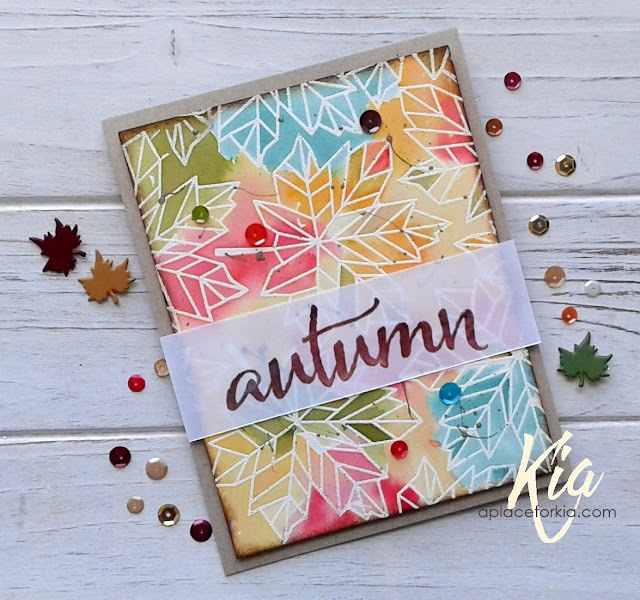 The deadline for commenting is October 2nd at 11:00 p.m. Central. 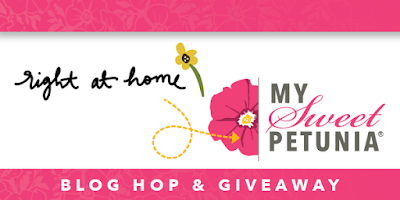 The winners will be announced October 3rd on the My Sweet Petunia blog and Kitchen Sink Stamps blog. 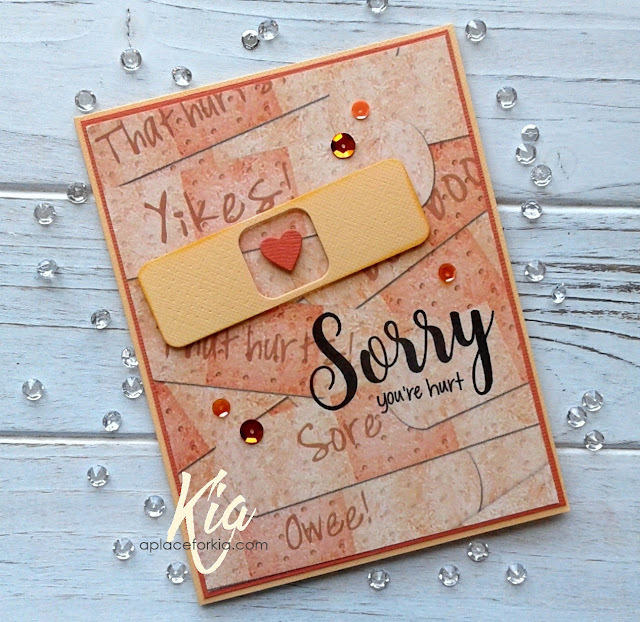 Now, on to the card I made. 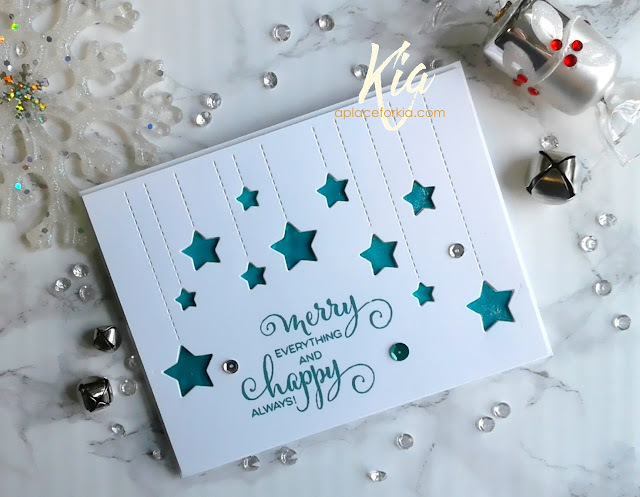 I used my Mini MISTI for my card today, and the new Bar Magnets, which are very strong. (I cannot wait to find out where they will hide themselves at some point in the future!) 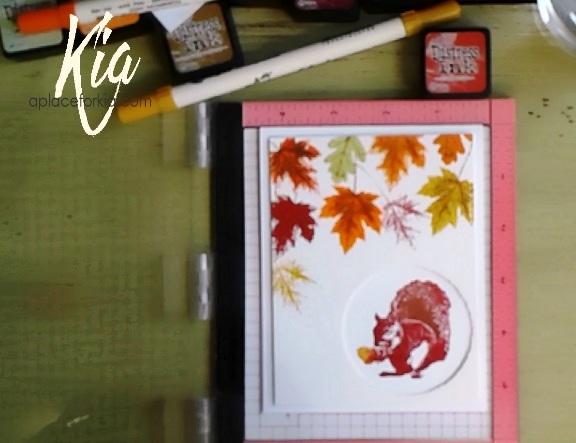 I am using the 3 step Autumn Squirrel stamp set for my card today. 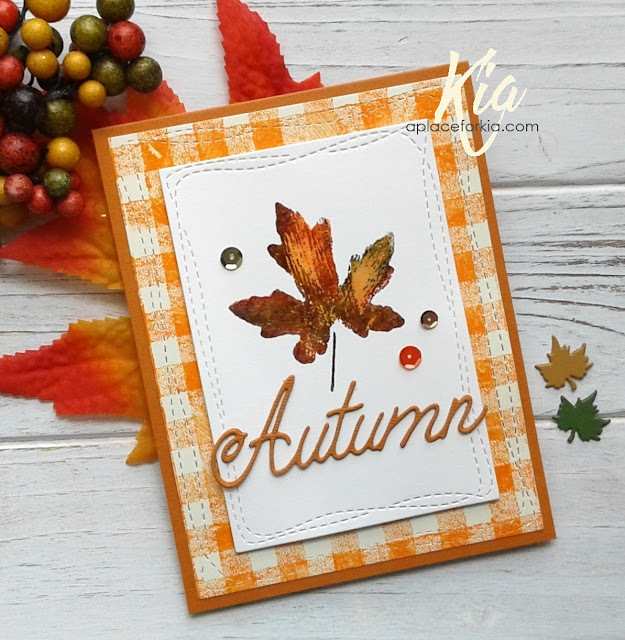 I started out by arranging and stamping the leaves around the top of my card in various distress inks. 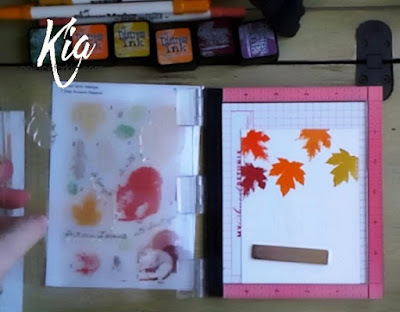 I am continuing to add the layers to the leaves using gathered twigs distress ink. Once finished I die cut using my stitched rectangles, and die cut the circle once I knew the placement of the squirrel on the card base, and added foam strips to the panel, which will be attached to the card base. For the squirrel, I used 2 of the 3 step squirrels as I wanted the base to remain in the white. 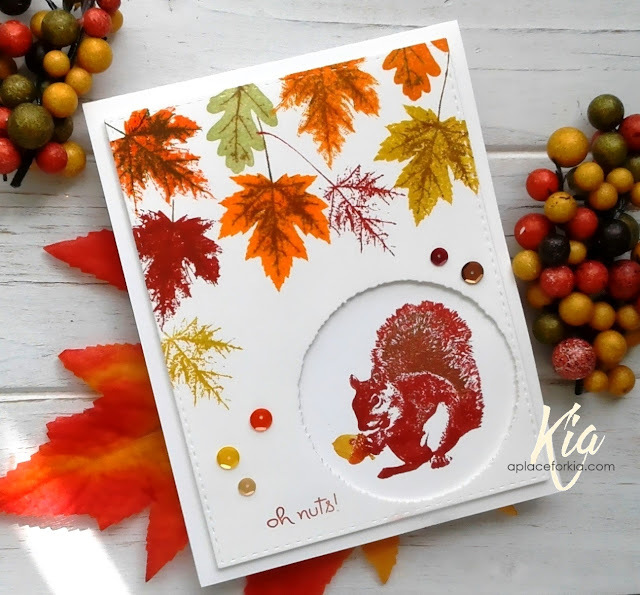 My squirrel is stamped in copper for the first step and heat embossed with clear embossing powder, then stamped in red, and heat embossed again to ensure the red was dry. The colours show up wonderfully in real life! 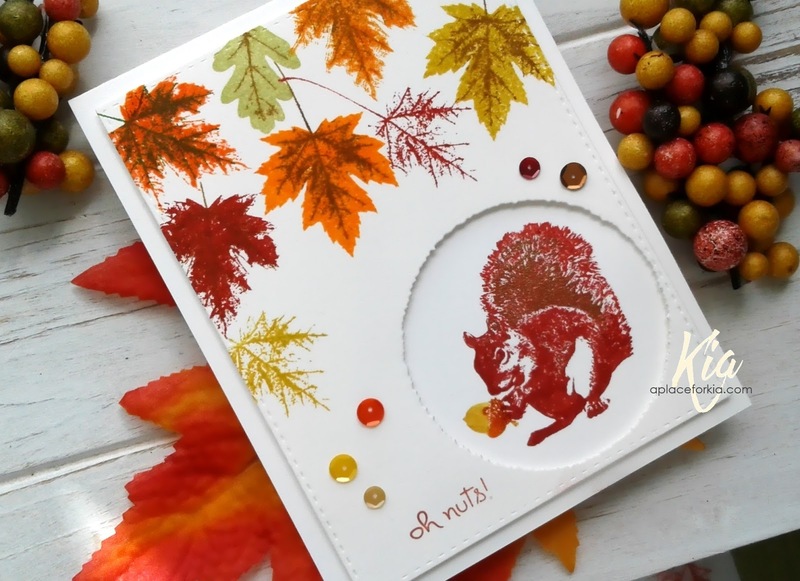 I added a little acorn for the squirrel, and stamped the "oh nuts" sentiment, also in the red. 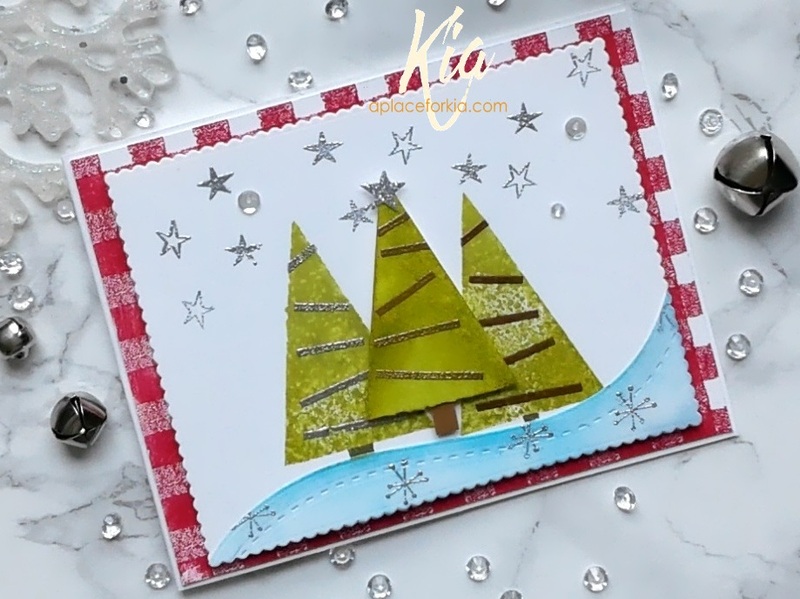 A close up of my card. The squirrel is stamped on my card base, and the top layer is added on foam strips, with the squirrel showing through the deckled circle. 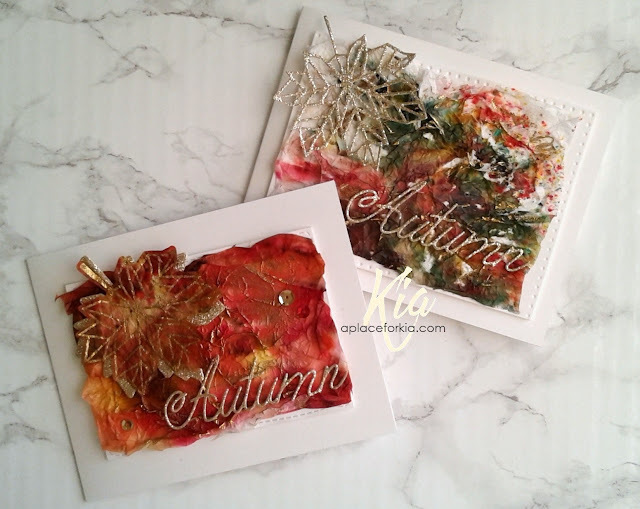 To finish my card, I added a few autumn coloured sequins. You should have arrived here from Lydia's blog. 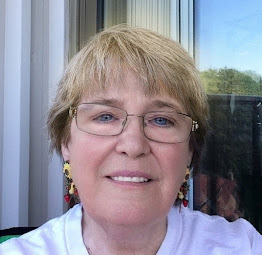 If not, you will want to start at the beginning of the hop at Maria's blog. The next stop is Ceal's blog, and following is a list of those participating in the hop. Thanks for visiting - have fun on the hop everyone. Products: My Sweet Petunia Mini Misti, My Sweet Petunia Bar Magnet, Kitchen Sink Stamps 3 Step Squirrel, Tim Holtz Distress Inks Spiced Marmalade, Fired Brick, Gathered Twigs, Shabby Shutters, Pumpkin Orange, Fossilized Amber, Dew Drops Brilliance Crimson Copper Ink, Clear Embossing Powder, Neenah Cardstock, Frantic Stamper Deckled Circle Die Set, Simon Says Stamp Stitched Rectangles, Sequins, Foam Tape. I could not make up my mind on the colour for my mug, so I did a bunch of colours! 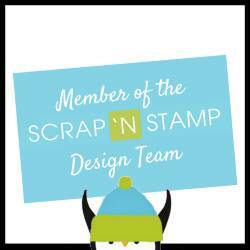 I first stamped and heat embossed the mug using white embossing powder, then die cut the piece with the wonky dies. I then proceeded with the water colouring using Tim Holtz Distress Inks adding layers of colour until I was happy. Once dry I splattered with more inks and an acrylic black ink, then attached to my aqua base. For my sentiment, I die cut the hugs using white fun foam, then coloured only the top with a glitter marker, leaving the sides white. It has the appearance that it is floating, which I like. And, being me, I added a few metallic sequins to finish. Products: Stamplorations Brew-tiful Day Stamp, Simon Says Stamp Hugs, Tim Holtz Distress Inks, Black Acrylic Paint, Martha Stewart Glitter Marker, Paper Garden cardstock, Fabriano Hot Press Watercolour Paper, Fun Foam, Sequins. This is Christmas Wonder, and the first time I have inked up this new to me stamp, which I really love called Cones and Berries by Penny Black. 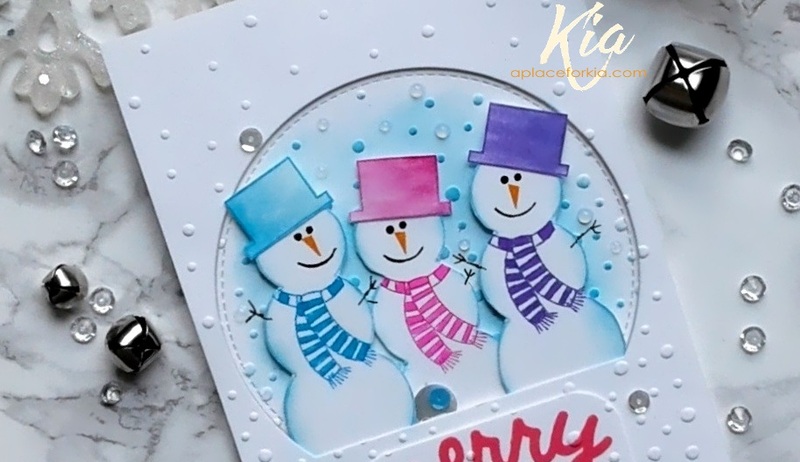 I started this card by first doing a watercolour wash using Daniel Smith watercolours in Manganese Blue and Cobalt Violet. To stamp the image, I coloured first with the browns, then the red and green colours using Tim Holtz Distress Markers. 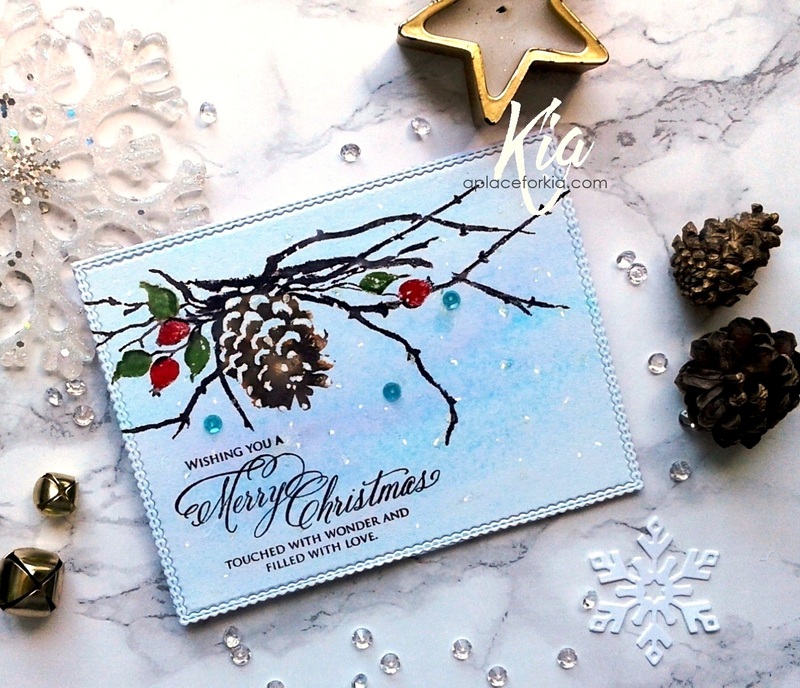 I added some White Gel Pen to the pine cone as well as scattered on the card. To finish I die cut my piece with the scalloped stitch trimming die and added a few small sequins. Products: Penny Black Cones and Berries, Penny Black Believe, Memory Box Scalloped Stitch Trimmings Die Set, Paper Garden Lavender cardstock for base, Fabriano Hot Press 140lb. 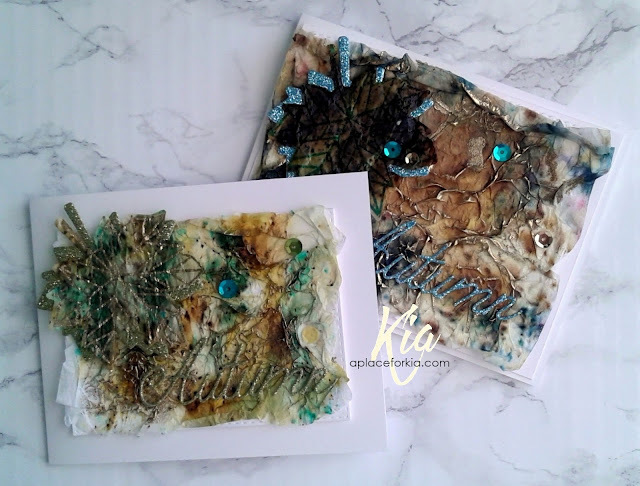 watercolour paper, Daniel Smith Watercolours, Tim Holtz Distress Markers, White Gel Pen, Sequins. I did this card for Frantic Stamper's latest Christmas release. I love this dangling star die, so I did another card using a different sentiment and colours. I die cut the panel then coloured the stars using Martha Stewart Glitter Markers. 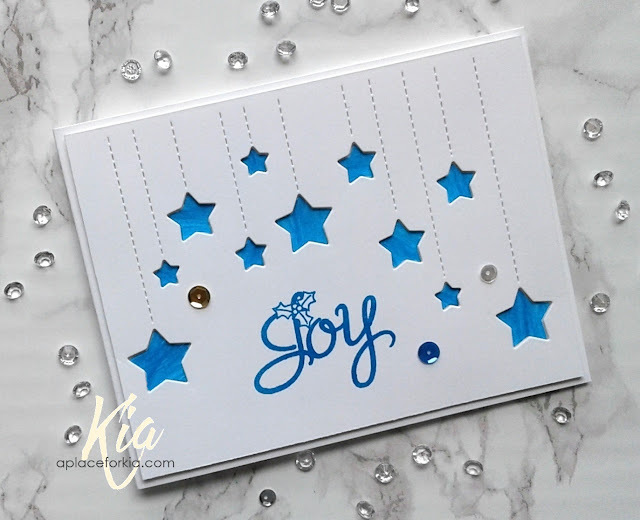 I use the negative from the panel to line up where the stars should go, then glue them to my card base. I stamp the sentiment, then use foam tape on the back to lift the panel from the base. 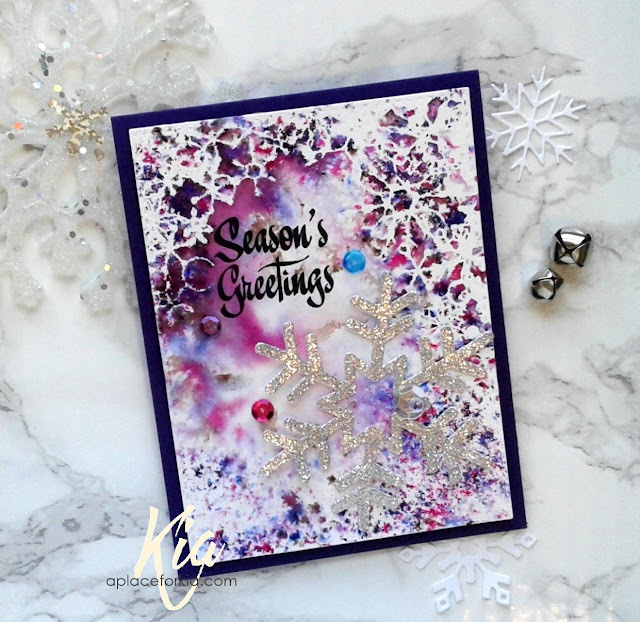 A few sequins complete my card. I very much like the look, and hope you do as well. I have a short video showing how I do this, which follows. 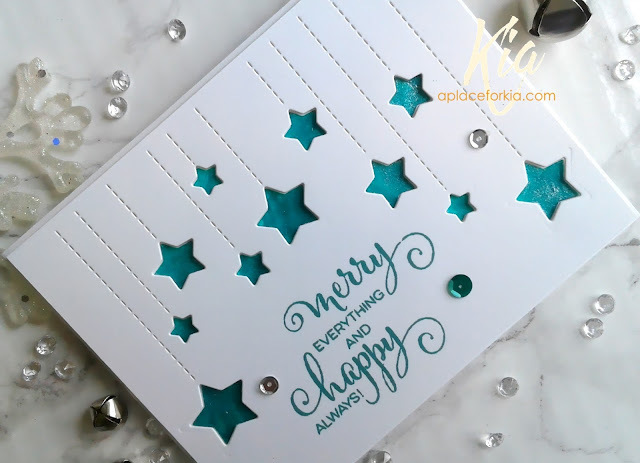 Products: Frantic Stamper Dangling Star Die, Frantic Stamper Joy & Peace Stamp Set, Penny Black Believe Stamp Set, Neenah Cardstock, Martha Stewart Glitter Markers, Foam Tape, Sequins.